← RP: As opposed to the doorknob? 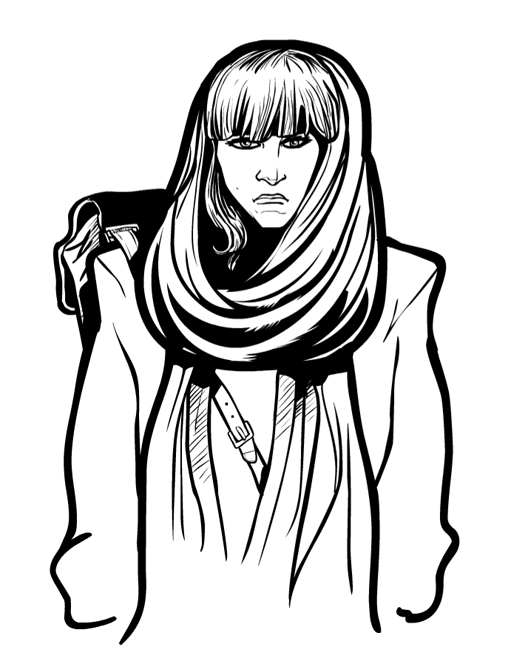 I totally screwed up the scarf to her left by her head, but otherwise I kind of like it. And here's the video of the sketch. I am working on getting a microphone so I can add voice-over, which I am sure will be the most eagerly anticipated theatrical release since "Avatar" went to the IMAX. What input device are you using? A graphics tablet or perhaps a touch sensative screen. I have been out of the illustration/cad indrustry for a while, digitizing pens were new then, I was using a graphics tablet with a puck. It was like trying to draw with a brick. You have a much finer control like you are using something more direct than a graphics tablet. its just that cursor to pen assocation has been difficult for me. My stupid brain. It’s just a regular old Wacom 4×5 graphic tablet, BroCoyote. I hear that a lot from people, though, that it’s hard to get the hand to do what the brain wants with the tablets. When I look back over older illustrations (like everything in HM 2.x for example), the line control is very, very poor. Partly that’s just time, but it’s also learning how to use the various brush sizes, how to vary the pressure of the pen, and how to use the zoom control so you’re drawing at the right combination of distance, brush size, and pressure. Note that that’s all specific to Flash, I don’t know how people draw with Illustrator as I don’t ever use it. Thanks, it was a really interesting tutorial! What kind of program did you use? Photoshop? Anyways, well done!